Duratop UPC 1200 – An economical modified acrylic blend especially designed for conventional spray, flow, dip or brush air dry finish operations. It offers benefits of energy conservation and higher application solids to comply with increasing governmental restrictions on solvent emissions, flammability and hazardous ingredients. 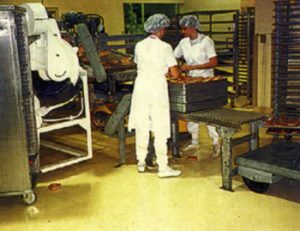 Durapoxy HP — A Novalac type polymer system with superior resistance to a wide range of corrosive chemicals, in many submersible conditions, for interior Food Processing Flooring as well as exterior applications. Acidguard — The ultimate acid resistant formulation for interior and exterior containment areas, even where the exposure is at elevated temperatures. Solventguard — Formulated for continuous exposure to strong solvents in extremely aggressive environments. Wallguard Systems — Coating systems for walls or ceilings which produce a tile like finish, available in several formulations which are companion products to Durapoxy HP, Acidguard, and Solventguard. Duraflex M — A flexible membrane system which can be applied under one of the Duraguard flooring or coating systems to provide additional stability and flexural strength. Thermalguard — A heat resistant polymer flooring system formulation capable of with standing elevated temperatures up to 500°F (260°C). Freezeguard — A unique formulation designed to cure at below freezing temperatures, on interior or exterior applications.